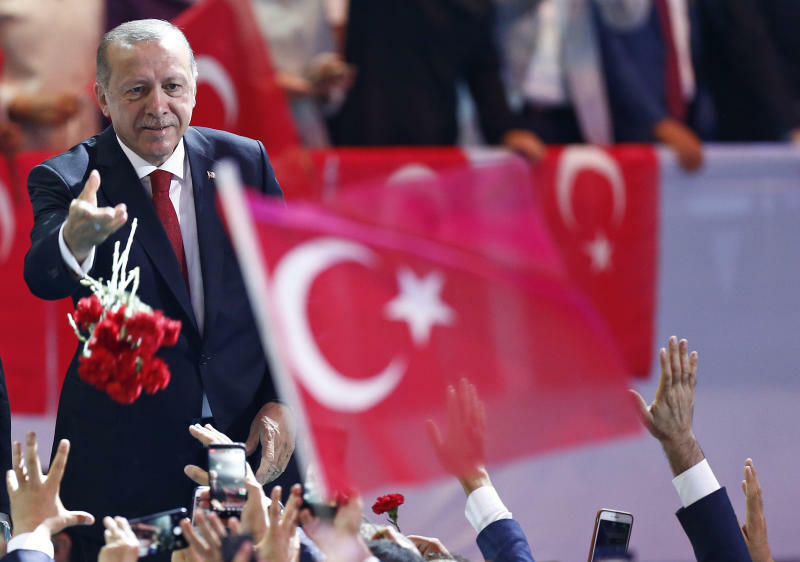 ISTANBUL (AP) -- Turkey's president said Saturday his country will stand strong against an "attempted economic coup" amid heightened tensions with the United States. Recep Tayyip Erdogan told thousands of supporters in Ankara that the country was being "threatened by the economy, sanctions, foreign currency, interest rates and inflation." "We tell them that we see their game and we challenge them," he said. Turkey is reeling from a massive sell-off of its currency as Washington imposed sanctions and threatened new ones if an American pastor under house arrest isn't released. Evangelical pastor Andrew Craig Brunson faces up to 35 years in jail if convicted of espionage and terror-related charges. He maintains his innocence. The lira's value dropped 38 percent against the dollar since the beginning of the year and sunk as low as 7.24 this week. On Friday, ratings agencies Standard & Poor and Moody's downgraded Turkey's credit rating further to "junk" status, pointing to currency volatility and concerns over central bank independence. Some Erdogan supporters at his ruling party's congress to elect a new executive branch wore shirts with the lira sign.